The Hotel da Bruno is very conveniently located in the dynamic Salizzada San Lio, right in the heart of the city’s historical center, just a moment away from St. Mark’s Square and the Rialto Bridge. Thanks to its strategic position, you will be able to enjoy all the main landmarks in a short walk and then, if you like, come back to have a little rest during the day. For three generations the Sartore family, the very picture of Venetian hospitality, has been welcoming at the Hotel da Bruno guests from all over the world, offering visitors the warmth of an old hotel tradition. Their experience and expertise in both hosting and the city of Venice guarantee a pleasant stay for all guests. At the reception, You’ll find polite and qualified staff who will be able to advise You on how to get the best out of your visit in the enchanting Venice. Recently renovated, the interior of the hotel provides all the luxuries and conveniences that modern travelers need while maintaining a certain charm with the historic building. A typical Italian breakfast buffet is served in the cozy breakfast room every morning, providing guests a refreshing start to a day of leisurely exploring. The aroma of coffee, the intense smell of freshly baked cakes and the bright colors of fresh fruits: a typical Venetian awakening to get Your day off to a perfect start! 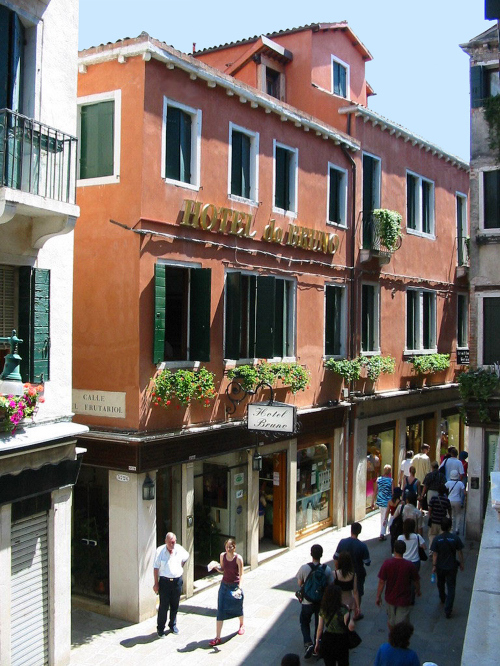 Hotel da Bruno, the pleasure of discovering Venice!